Liz Schmitt is a home chef whose cooking dramatically changed after her husband’s heart attack in 2011 and cutting back on salt became imperative. She blogs at Liz the Chef, specializing in low-sodium recipes, and loves Meyer lemons more than ever as a salt substitute and flavor booster. You can also follow her on Facebook and Twitter. Canning is something that takes me back to my mother’s and grandmothers’ kitchens, a comforting ritual that evokes happy family memories for me. 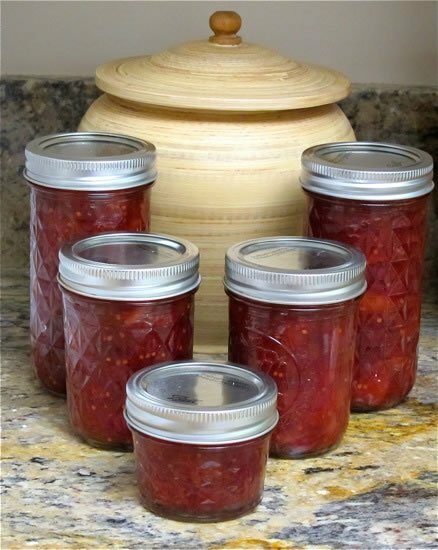 I’ve been making a version of this cherry-apricot chutney for several years, thanks to my friend, Mary Constant, whose cherry chutney recipe inspired me several summers ago. For the “Unprocessed” challenge this October, I tweaked the recipe yet again, substituting honey for white sugar and using unsulfured dried apricots instead of the sugared dried cherries in the original recipe. Crystallized ginger (more sugar) wasn’t missed at all when I used grated fresh ginger, and cumin added the spicy note I wanted. This delectable topping is perfect for those fall moments that this would add the perfect touch to your dish. Using a large, heavy-bottomed pot, heat the honey, and cider vinegar until it begins to boil. Add the cherries, fresh and dried apricots, onion, lemon zest and juice, mustard seed, ginger, and cumin. Stir to mix well. Bring chutney to a boil, then lower temperature so that chutney barely bubbles. Cook over low heat for 2 hours, stirring occasionally. Store in covered container in fridge for up to 1 month or can in sterile jars. Wow – what a flavor combination. Just put this on my must-try list. I could imagine this going well with so many different proteins! Nice post. Great sounding chutney! One of the surprises for me when doing my first #Unprocessed was that even home canned jams and chutneys can fail the unprocessed kitchen test, usually due to all the sugar! Great tweaks!, sounds delicious! Liz, you are the best at canning and your chutney’s. Have enjoyed reading your blog and all your recipes from your family! Wow, that flavor combination is fascinating! I’m filing this one away for spring when I stock up on stone fruit. Can’t wait. Thanks, gang, I have to admit this chutney has become my favorite. I dropped the white sugar and don’t plan on using it again in future batches.